I know, I know, dear Reader. It has been an age since my last post. I promise it’s not because I’ve forgotten you, it’s just that we’ve hardly had a chance to draw breath since renovations started. It has been so full-on over the last few months and it has felt at times as if it would never end and we’d wind up living without heating or running water and cooking on a camping stove forever. There’ll be time for stories of derelict farmhouse chic soon enough but before the chaos of Christmas descends upon us, there was just a little time for some much needed recharging of batteries. After a long and winding renovation road which isn’t over yet, the four of us needed to escape the farmhouse a couple of weeks ago. I can’t lie, dear Reader, the building work has taken its toll on me and managing a building site, working full time and keeping two small people (as well as Jerry) on the straight and narrow has left me utterly exhausted. Jerry and I knew it was going to be hard but the constant day-to-day dramas and trying to keep it all from falling apart (literally rather than metaphorically on some days) was far harder than we ever imagined. Still, we both know that the little farmhouse is worth it, no matter how many times we think we’re recreating scenes from the 80s classic film, The Money Pit. So when Fanny from Warborne Farm suggested a visit to her beautiful family run farm in the New Forest, it was too good an offer to refuse. A weekend away from our own farmhouse was just what the doctor ordered and my goodness, Warborne Farm really didn’t disappoint. Warborne Farm is a family-run 100 acre farm which boasts a selection of lovingly converted boutique barns, perfect for families, couples and those who need nothing but cosiness, long walks and a chance to while away the hours just pottering in the New Forest. Arriving to a roaring fire in the woodburner, the Grain Loft became our home from home for the weekend. It was time to sit back and enjoy the peace without the constant whirring and banging of builders. We have stayed in some truly beautiful places but I have to say that the attention to detail when it comes to decor is second to none at Warborne. This is farmhouse styling on a totally different level. It is functional but beautiful, cosy and rustic yet chic. I applaud all the little things which make a stay at Warborne Farm so special – sheep fleeces on the beds from the farm’s own flock, a light fitting made from the original pulley system used for hauling up hessian sacks of grain for storing, shutters handmade by Kate’s mum Ann, bedside tables carved from blocks of Douglas Fir from the New Forest and sills once part of an old sunken barge found emerging from the mudflats. Modern, rustic and so homely. However, I’m not sure the girls and I will ever get over being able to watch our ‘neighbours’ as darkness embraced the world outside and the fire’s glow lit the scene below. With a viewing window in the sitting room floor, we were able to marvel at the farm’s Boer goats and their kids sleeping in the shed beneath us. A little slice of farm magic. After stories and hot chocolates, much chat about how goats go to sleep and whether we could adopt some for our smallholding, the girls reluctantly left ‘goat watch’ for bed. What a bedroom it was too, dear Reader! Stalls converted into a stunning 4 bed dorm with beds of hay mattresses made from ox-eye daisies, ladies bedstraw and other wild flowers from the farm meadows. Bringing a whole new meaning to the phrase ‘hitting the hay’, Poppy and Primrose couldn’t wait to hunker down for the night. Strictly on the basis that they could wake at the crack of dawn the next morning to feed the goats of course…..
With a long soak in the bath, a glass of wine or two and a squashy bed to sink into, I went to bed dreaming of Heidi and her grandfather’s chalet in the Alps. On waking from the best night’s sleep I’ve had in ages, it felt like I was still there to be honest, dear Reader. Getting to know the farm’s residents was firmly on the agenda when the girls surfaced for breakfast. Alongside the goats in the shed below our sitting room, we discovered there were chicks cheeping away too. A short wander from our barn led us to the orchard where friendly and rather dashing Swiss Valais sheep greeted us, portly Kune Kune pigs squeaked and grunted with delight at having visitors to scratch their bellies and armed with a basket, the girls collected eggs from the farm’s hens. One of the most marvellous parts of a stay at Warborne is the chance to experience farmhouse life of your very own. This is the sort of weekend that allows you to forget the outside world exists – simply switch off and free range. Poppy and Primrose bounced on and off haybales in the barn to their hearts’ content. We couldn’t get over the marvellous selection of vegetables in the farm’s burgeoning polytunnels, just waiting for guests to help themselves. That’s not all, Warborne Farm has good eco credentials too. The farm’s heating and hot water needs are run on renewable energy sources and the family take pride in the fact that the farm has been run along organic principles for the last three generations, ‘sustainably exploiting the natural resources’ available to them as they put it. This is not only a luxury barn stay but one with a genuine conscience. We stayed in the Grain Loft which sleeps 8 but there are plenty of other gorgeous converted barns to stay in at Warborne – all unique, all very private and luxurious. I took a sneak peak at the enormous copper bath in the Hay Loft next door to us. Thought I’d died and gone to heaven. Jerry found it very hard to prise me away from its shiny exterior – I think that the words ‘gin o’clock’ may have been applied as antidote, dear Reader. Of course should you wish for a fix of the outside world, Lymington isn’t far from the farm’s doorstep. Perfect for stocking up on supplies, taking a stroll on the sea wall or finding somewhere cosy to stop for a bite to eat or a swift half. However, there’s so much of farm life to enjoy at Warborne, you’ll find it hard to tear yourself away. To be honest, it was almost too good to share with you, dear Reader – I’m already planning a return to Warborne for a little more digital detox to ward off the January blues and get some more words scribbled. It’s the perfect place for a retreat. The girls are still asking Jerry and I when we can get some goats and cut a hole in their bedroom floors to accommodate viewing windows and I wasn’t at all sure that I wanted to come back to our own little farmhouse after such a wonderful weekend of slow living. However return we did, with bucketfuls of ideas for our own project. Hay mattresses, shutter designs, polytunnels…….oh and geese. They are definitely on the list for our field in the spring, dear Reader. Sshhh…….don’t tell anyone but should you wish to book a January escape to Warborne Farm, there’s currently 25% off on all January bookings. Well worth it I’d say dear Reader. Do follow @warbornefarm on Instagram for more details. This entry was posted in Margot's Country Snippets, Out and About and tagged #kinfolkhome, 100 acre farm, Boldre, building project, chalet chic, cottage, country escape, countryside, derelict farmhouse, eco barn stay, farmer, farmhouse, farmhouse decor, farmhouse life, farmhouse love, farmhouse styling, farming, free range, Hampshire, hay mattresses, Heidi, hitting the hay, January escapes, luxury barn stay, luxury farm stay, Lymington, modern rustic, New Forest, New Forest self catering, off grid, organic farm, organic farming, places to stay, polytunnels, renovation, self catering barns, self sufficiency, slow living, slow winter, staying away, Swiss Valais sheep, unique places, unique stays, vegetable growing, warborne farm, weekend away, weekend boltholes, wellies, winter magic on December 21, 2017 by admin. Only mad dogs (Monty) and mad Englishwomen (clearly Margot) would leave the house just after 6am for a trek through a muddy wasteland. 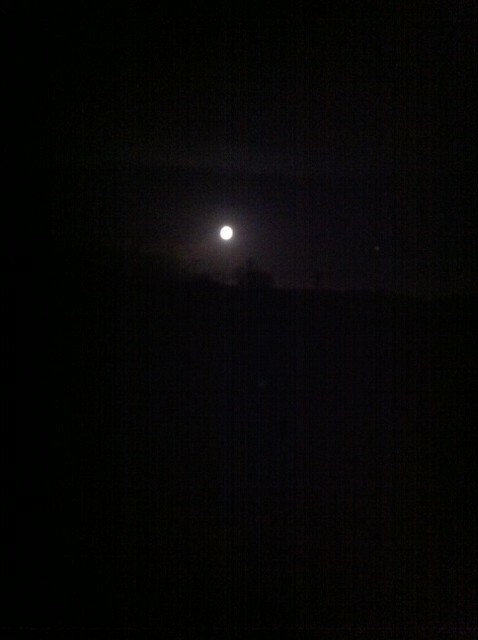 A full moon this morning made me feel even more crazy than the villagers already think I am. Mud mud mud everywhere. I do promise dear Reader that I won’t bang on about the weather but we are beginning to feel as though we ought to have bought an ark rather than an old cottage leaking under the pressure of days (weeks….months…..need I say more) of torrential rain. Our sitting room ceiling has had a soaking and the bay window has the added glamour of being covered in a tasteful blue tarpaulin to allow for some drying out. Fat chance! With yet more rain on the cards, the wet dog and I have been forced to venture out for early morning walks as these days, Poppy (a demon of terrible twos), has taken to refusing to walk for more than 100 yards before sitting in the middle of the road, screaming to be carried. All efforts to sit in a backpack have fallen by the wayside as she is now far too big for it and before you suggest it, dear Reader, getting her to hitch a ride in the buggy is a battle of wills which only the steeliest of grown ups could face. I have more than a handful of times carried her on my hip for a mile whilst Monty pulls us along but quite frankly, that idea has now been binned as completely impractical too. So walking in the dark before dawn is the only option the poor hound and I have left for now. Donned in my finest garb (muddy boots, black beanie hat, one of Jerry’s old jumpers and even muddier jeans), I look a magnificent sight first thing in the morning, I can tell you. The headlamp strapped to my head is an added style bonus (thanks Juniper for that Christmas pressie). Usually I am up to the woods and round the village before being spotted. However, not this morning. A voice called out good morning from a muddy field (another mad Englishwoman with headlamp on tending to her horses in the field across the road) and I was forced to hold a conversation with no make up on and looking the picture of country glamour. Note to self: Do not scare locals first thing with your ‘just got out of bed’ look. Some things are better left unseen. Is it true that dogs look like their owners? I seem to spend my life looking like I have been dragged through a hedge backwards since we moved from town to country. Gone are the days when I used to look into the wardrobe and find a pair of shoes and matching handbag for every outfit. Footwear of choice these days? 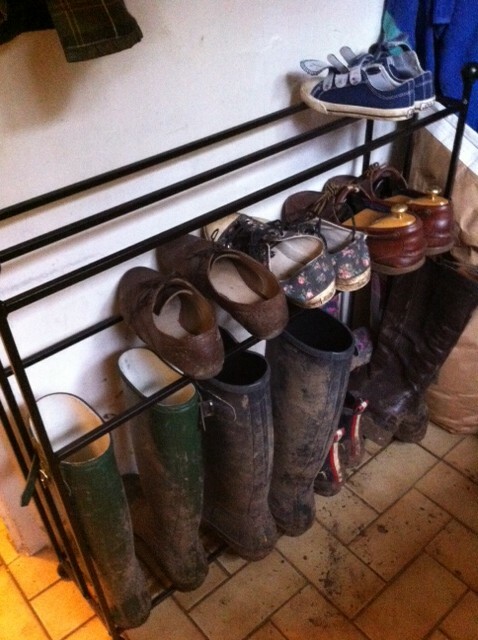 The ever practical WELLINGTON BOOT. Can be worn for any occasion I don’t doubt, dear Reader. Lordy……just realised that I might just be morphing into Barbara – can’t remember the last time I wore a pair of heels (or shoes come to think of it) that weren’t covered in mud. Jerry and I even trek to dinner parties in wellies – I say trek, more like stumbling on and off roadside verges yelling at the sight of headlights along the lane or wading across fields in the dark with a dodgy torch panicking about being eaten by foxes, badgers or the mythical village mountain lion. (We still haven’t got the hang of not being able to call a taxi to get us home. Why are there NO taxis in the countryside?) Perhaps my new wardrobe saviour will be these little beauties from Rollasole? Love the idea of having a pair of stylish flats curled up in my handbag (more likely the pocket of Jerry’s Barbour) ready to wear when I reach my destination! How did I not know these existed? Maybe I can persuade Jerry to buy me a pair in every colour……. 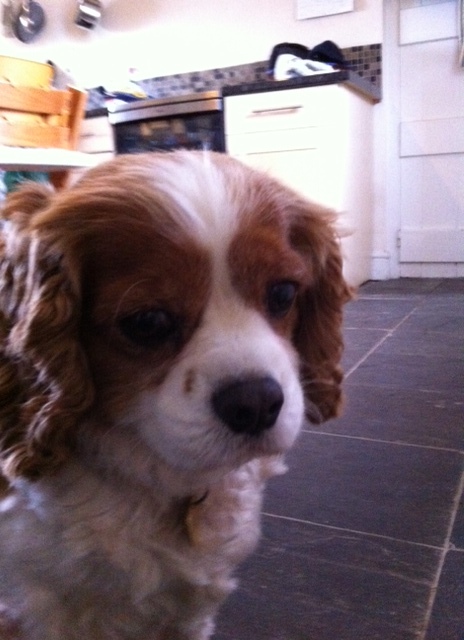 This entry was posted in Country Sense, Monty's Tail, Village Life and tagged country, dogs, glamour, mud, rain, Rollasole, shoes, wellies on January 20, 2014 by admin. The green green grass of town – best patch I could find! To be honest dear Reader, I hate to admit it but I have felt a little blue this week. With the sale on the cottage moving forward, leaving London has actually become a reality. One would have thought that I would be leaping from The Shard (well metaphorically speaking of course) and I am….but….the prospect of moving, both thrills and terrifies me all at the same time. I can honestly say that I will be sad to say goodbye to our little home. I am an awful creature of habit and lately have been wondering how on earth I might do without all the things that I have become so accustomed to and are readily available to me, living in the Big Smoke. Sitting in a rather fashionable tapas bar in South Ken. with my oldest chum, Perdy, I was instantly reminded of some of the things that I would be giving up moving to the sticks. For example, where else but in Kensington can one wear a fur without looking conspicuous?! Sans children (a rarity these days) and talking of the old haunts of our youth with Perdy over a glass of fizz, bottle of red and several cocktails, I felt a strong magnetic force attracting me to the pavements of town. Cheered by the memory of London times past, I skipped into the cottage at midnight just before the black cab turned into a pumpkin and my dress back into a housecoat. Waking the next day, Jerry expressed concerns that perhaps I was not ready to change my townie habits and live a quieter life in the countryside. I pondered this for a moment with a pounding head. Not ready for the countryside – what?! I already own the ubiquitous Barbour, mud-blotched wellies, stylish country hat and was about to book a day’s shooting (and cake eating!) with the lovely club of Ladies Shooting (@LadiesShooting) for my birthday! I have made passable chutney and even learned how to bake a loaf of bread! Cranford could not hope for a better arrival in the village! What on earth did Jerry mean I wasn’t ready for the good life?! Outraged, I rang my dear Mamma and the same sentiment was echoed by my darling parents who both thought that my love of handbag boutiques, journeys in black cabs and late night suppers in swanky restaurants would not be compatible with a life in the countryside. I have no idea how this impression might have been formed….and anyway, one might apportion some of the blame to one’s parents for instilling such levels of luxury expectation! Sadly, I have to confess that my love affair with town and all things luxury began some time ago. Jerry and I are spoilt in our little corner of suburbia with all kinds of treats available on our doorstep: wine, cheese, bread, a wonderful little bookshop, baby boutiques, a designer shoe emporium, delicatessens galore and even a French traiteur. Guaranteed, it also has the one and only Londis in the country to sell artisanal produce and truffle oil! I can remember that when Primrose arrived, I spent the first few months pushing her in a bouncy Silver Cross number, heading to local yummy mummy meccas and tea salons, developing a rather expensive taste for honey lattés and cashmere babygros. 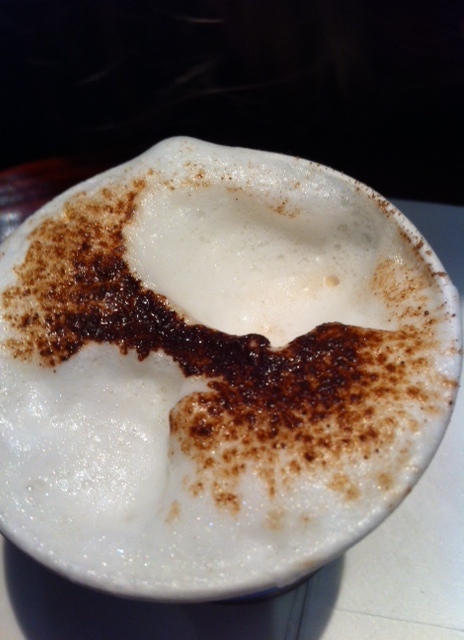 Only in SW London would children be offered ‘babyccinos’……. The ease of life in the suburbs of London had enveloped me with the comforting embrace of a downy duvet and I had taken to it like a duck to water. Maybe Jerry was right? How would I manage? Dashing out for a pint of milk or a loaf of bread in the future, might well mean ten minutes wrestling the girls into the car before driving to the nearest village shop or supermarket a few miles away. Weekday impromptu suppers with dear friends shall become a thing of the past and no doubt, I will have to trade in all pairs of heels and French Sole pumps for gumboots in various colours. Gone too, will be trips to the local library and morning walks to nursery school. Child-friendly gastropubs will be exchanged for sitting in village pub beer gardens, watching the girls clambering over rusty climbing frames and diving into mudpies. Perhaps one of the most catastrophic losses in the move (the very mention of this one brings on hyperventilation) will be my beloved hairdresser. Dear Reader, I do not have to tell YOU the importance of the perfect hairdresser who cuts and styles one’s hair just so. It took me 4 years of bad haircuts and seriously dreadful layering before I found the holy grail of hairdressing. Even now, I am loathe to give the name and number of said hair cutting fairy godmother to friends, lest they steal precious appointments! Living with the loss of my coiffeuse, thank goodness Jerry saw fit to give me the gift of a coffee machine so that I can still indulge in my daily caffeine habit and swoosh my own skinny ‘cappu’ in the mornings once we live beyond the outer edges of café civilisation. 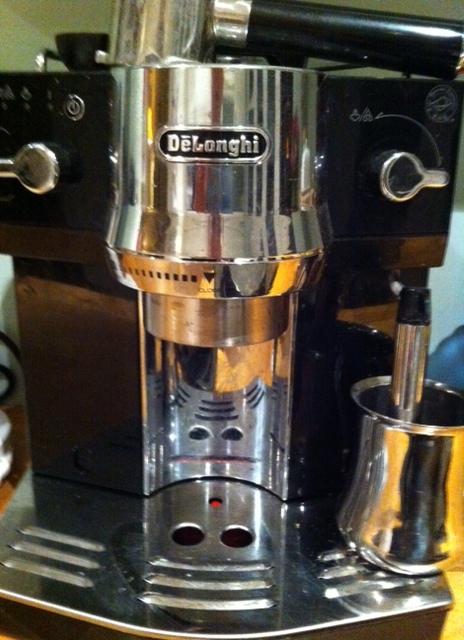 All hail new kitchen gadget! With all these trappings of the Big Smoke a thing of the past in 5 months’ time, one might be forgiven for thinking that the grass was most definitely not greener in the countryside. Somehow though….moving feels instinctively the right thing to do. Views of farmland, wildlife on the doorstep, game fairs and county shows, farmers’ markets and taking the dog out for a walk in the early morning mists…..I think that I could give up London for all of that. Dragging dear Mamma, Primrose and Poppy to a farmhouse surrounded by fields, only to find that it was damp from top to bottom and had 2ft of water in the cellar, I found that nothing could stifle my overwhelming desire for a country life. Primrose ran round the garden with careless abandon, whooping with delight at the vast expanse of grass and for a moment, I too, was lost in an idyllic rural reverie. I envisaged tending a kitchen garden, cooked imaginary kitchen suppers beside the Aga and basked in the light from the floor to ceiling windows hitting the parquet floor in the dining room. It was only when Mamma pointed out moist wallpaper and mouldy carpets (not to mention a bathroom reminiscent of a Victorian outhouse and farm lorries clattering down the track in front of the farmhouse drive) that I made my apologies to the estate manager. So is the countryside grass greener? Well I for one, am game enough to give it a go! This Margot is definitely ready for a taste of the good life. 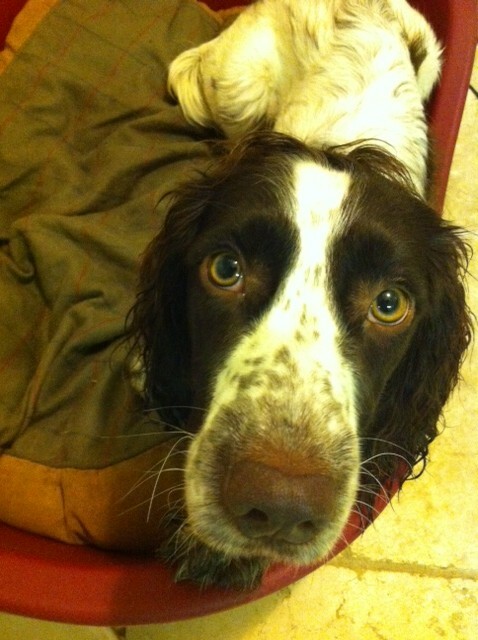 Now if you could just find me a new home, dear Reader, I would be most grateful! Preferably one that isn’t under water! 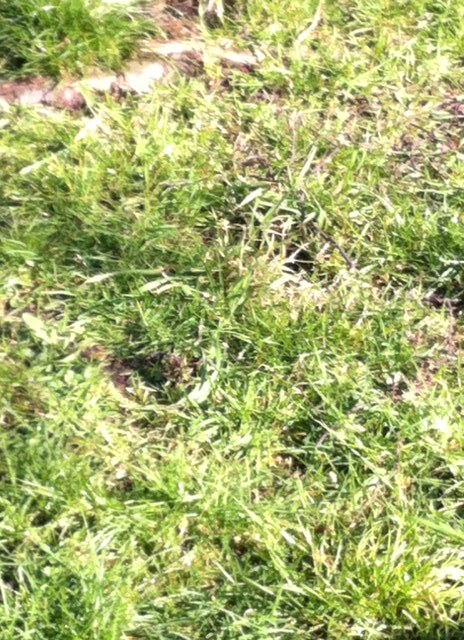 Is it me or does this grass look distinctly greener? This entry was posted in Country Sense and tagged babyccino, Barbour, black cab, country, countryside, farmhouse, grass, Kensington, London, rural, shooting, wellies, yummy mummy on February 19, 2013 by admin. 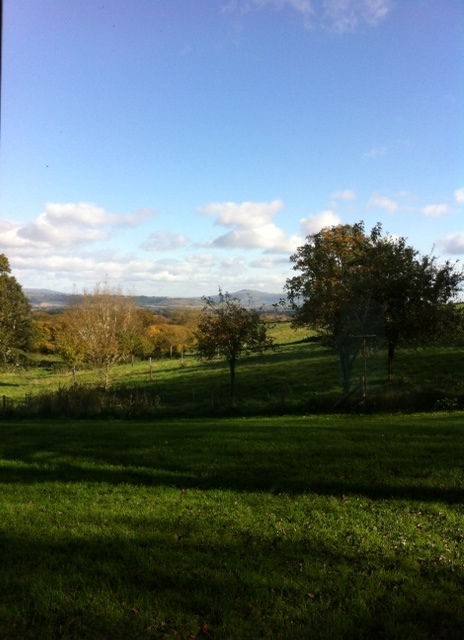 This weekend heralded the long awaited trip to Tom and Barbara’s dear little country pile. Setting off on my 3 hour journey in the car with Primrose and Poppy, I dutifully set the sat nav (Nancy). I can’t travel without it. I have no idea of how to read a map (really!) and I find Nancy’s calm robotic voice strangely comforting on long journeys. All was going well until I came across one small problem…. It appears that people in the countryside do not have proper addresses, there are no proper road names and one must look out for clues in order to get anywhere (past the chevron, look out for the orange ribbon)! Not far from Barbara’s hilly home, Nancy directed me down a small bumpy lane and then into a very boggy field, promptly adding and with a rather satisfied tone of voice I might add, “You have reached your destination”. It would seem that I had not reached my destination and was heading in the direction of Wales. Turning the car round in a very muddy field had its challenges but mission completed, I finally reached the farmhouse before nightfall. I realised from the moment I exited the car that this would not be a weekend for wearing my little suede pumps and Boden trench. Strictly wellies and waterproofs only. 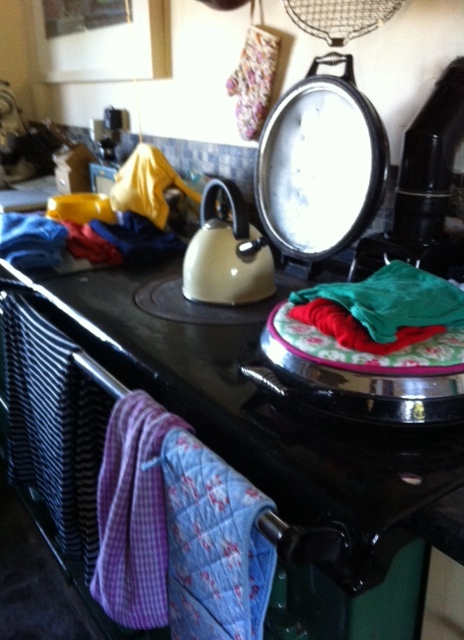 The warmth emanating from the kitchen drew me in and there it was, Barbara’s pride and joy: the Aga. Draped in the washing, it not only proved itself to be a thing of beauty but an essential part of country living. The sound of the whistling kettle heralded the all important cup of tea, another countryside staple, and an unctious casserole was bubbling away in preparation for supper. I will admit to a touch of the green eyed monster at this point. I have always dreamed of an Aga and I feel that no countryside home would be complete without one. Never mind that it can be temperamental, that it takes a little longer to boil the kettle, that most people who have an Aga also have another electric oven too. Oh no, what could be more perfect than toasting bread on the Aga top, leaving meat to stew for hours in the low oven and even being able to bring newborn lambs and pigs back to life on the warming plate? It is THE countryside status symbol and I LOVE it. Waking next morning to the sound of tractors in the nearby fields, I looked out of the farmhouse windows and was rendered speechless. Unusual, as I sure my dear Reader, you can imagine. It struck me that the view alone would be enough to render one a hermit, never leaving the house except to forage for food. Dear old Barbara even has her very own Downton on the doorstep (we could hear the guns on our walk across the fields) and a heavenly orchard at the bottom of the garden. Turns out the orchard doesn’t really belong to the garden and Primrose was appalled as I gingerly vaulted the gate to ‘scrump’ apples, snagging my cashmere cardi on the barbed wire as I went over. ‘Scrumping’ is the countryside term for filching apples from someone else’s land. As I landed on the forbidden side of the fence, I had visions of myself sketched on a Wanted posted (looking rather delightful in tweed) and half expected a farmer to come over the brow of the hill with a shotgun yelling “Gerroff my land”….. I have always enjoyed indulging my rebellious side. 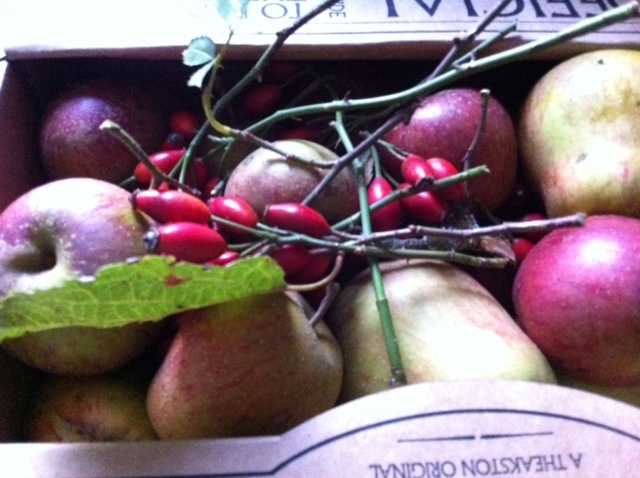 Apples well and truly scrumped, I even managed to bag some delicious rosehips whilst shredding my hands into the bargain. What one will do for a good foraged hoard! Safely back on Barbara’s plot, she told of plans for chickens, showing us her homemade coop all ready for the imminent arrival of her feathered friends. Knowing her, there will even be a donkey just in time for Christmas. A new puppy is also on the horizon. Although, Barbara has had her fair share of dogs of late and was babysitting her very own canine ‘criminal’. One of the most entertaining and seriously comedic moments of the weekend was the sight of dear old Tom running through the orchard after Shropshire’s answer to Fenton had escaped the farmhouse boundary and was heading for the next county! Returning to the business of Margot learning all about the countryside…. You would be proud, dear Reader. I found myself imagining walks with my liver Spaniel wearing a tweed shooting jacket, pulling on the wellies in my Liberty tea dress to collect eggs from the dear Burfords and even preparing game pies in the Aga for the shoot lunch. I even caught Jerry eying up Tom’s muddy and robust Land Rover, having a country day dream all of his own.With a roaring fire in the snug, a wee snip of Barbara’s homemade Damson gin glistening ruby red in my hand and visions of myself smothered in the warmth of the Aga living in perfect domestic bliss, I felt that our move to the countryside couldn’t come quicker. This is what the countryside seems to be all about. They say that home is where the heart is. I would disagree: home is where the hearth is. What could be more perfect than toasting one’s bottom on the trusty Aga after a wet and windy walk? This entry was posted in Country Sense and tagged Aga, countryside, hearth, jerry, margot, mud, Primrose, scrumping, walks, wellies on October 30, 2012 by admin. Following some sage relocation advice, we decided, on a dank and miserable day, to try and get the feel of our new countryside home in all weathers. Countryside pursuits come in many forms and I confess to being pretty keen to join the hunting, shooting, fishing set as those countryside activities appeal to my more primeval instincts of getting food on the table. Somehow walking doesn’t have the same pull and especially in the rain. Walking in town always has a purpose: going to my favourite boutiques, popping out for a coffee, lunching out…. Even when Jerry and I take the girls to the park, it is usually with a view to letting off steam rather than specifically going for a walk. Walking for walking’s sake – who ever heard of such a thing? With our visit to Tom and Barbara’s hilly home nearly upon us, we braved the inclement weather for a romp through Morgaston Woods to improve on our walking skills. Shedding our London look, Jerry and I donned ourselves in our ‘country’ gear and I even dusted off the unused Barbour. I was overcome with envy at the sight of Jerry’s new flat cap and woollen welly socks and I found myself disappointingly lacking in tweed. Something which must be remedied. Putting on our wellies, stomping through the leaves and squelching through the boot sucking mud made me appreciate how autumn is so much more beautiful in the countryside. Perhaps one just allows oneself more time to stop and admire the seasonal changes in the landscape? This time of year Morgaston Woods are alive with fungi and we had a lot of fun spotting various delicious or deadly treats. 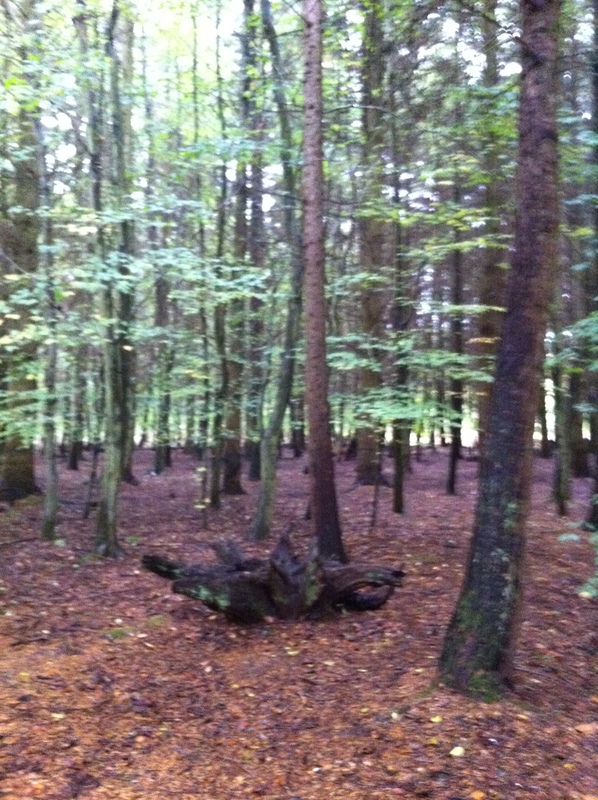 Sadly, having missed the seasonal fungi foray walk, we had no idea of what we could or shouldn’t pick. I am yet to find a good book for mushroom dummies which helps with identifying the edible varieties and poisoning my nearest and dearest is not high on my list of country to-dos. We had to make do with just….a walk. A walk. “What could be more glorious!”, some might say. However, the walking, grey drizzly weather and quagmire of mud shone some light on our ability as a family to adapt to the countryside and all its earthiness. Primrose is renowned for her inability to use her God-given limbs. She hates walking and gives up, asking to be carried after the first five minutes. To solve this problem, she acquired a bicycle. Cutting a long story short, on this occasion, we were persuaded that she would walk some of the way if we took her bike along. If only we could have predicted the untold muddy disaster which followed! Primrose took a turn too fast on her bicycle, skidded off the path and then promptly fell forward, face down into the mud. Tears flowed shortly after. It would seem that our dearest Primrose does not like mud. The idea of mud? Yes. But in reality, when her hands, trousers and hair were covered, it was all a bit much. Jerry remarked that at least it wasn’t a cow pat. Calls for dear Primrose to ‘toughen’ up and “This is what it is like in the countryside!” did not abate the weeping either. She could only be persuaded to finish the trek with the lure of a hot chocolate. I have to say we did bump into some locals and did see a few raised eyebrows….the bike was perhaps not the best idea we have had! Once crisis resolved, we forged onwards, kissing gate successfully negotiated with Primrose on foot, Poppy in the backpack carrier with Jerry and me dragging the bloody bicycle, cursing as I went. (Dear Reader, I have already thrown the bicycle into the mud prior to this point, shouting that it would have to be binned if Primrose was not going to ride it. God only knows what the locals were thinking at that point)! 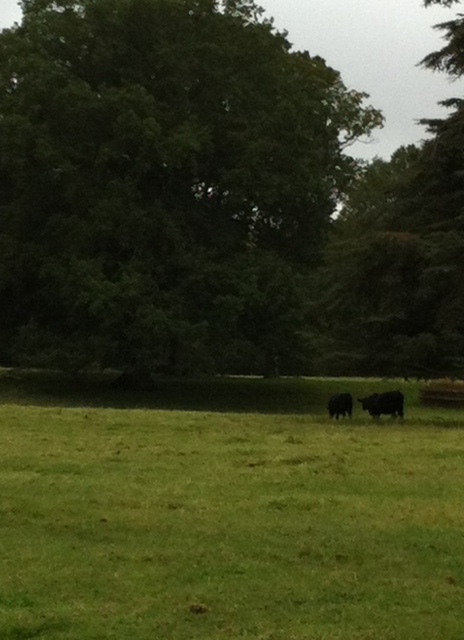 We ended up in a field of beautiful black cows. Calming and so very sweet. Despite Jerry’s best efforts to stop me, I decided that maybe I was going to be the next Dr Doolittle and would try to see if the cows would come over to us. Surprisingly they DID! Finally, Margot at one with nature! 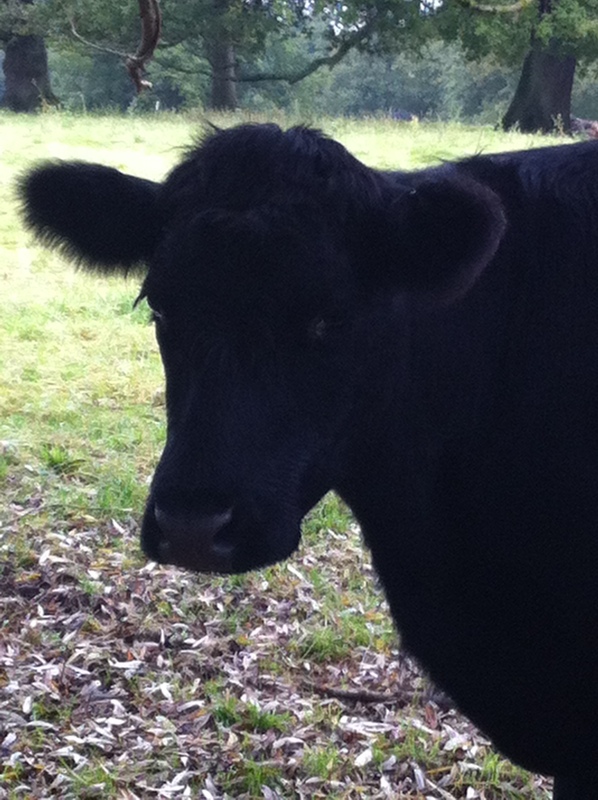 My prize…being licked by a baby cow whilst I stroked its nose! Here is the little beauty. 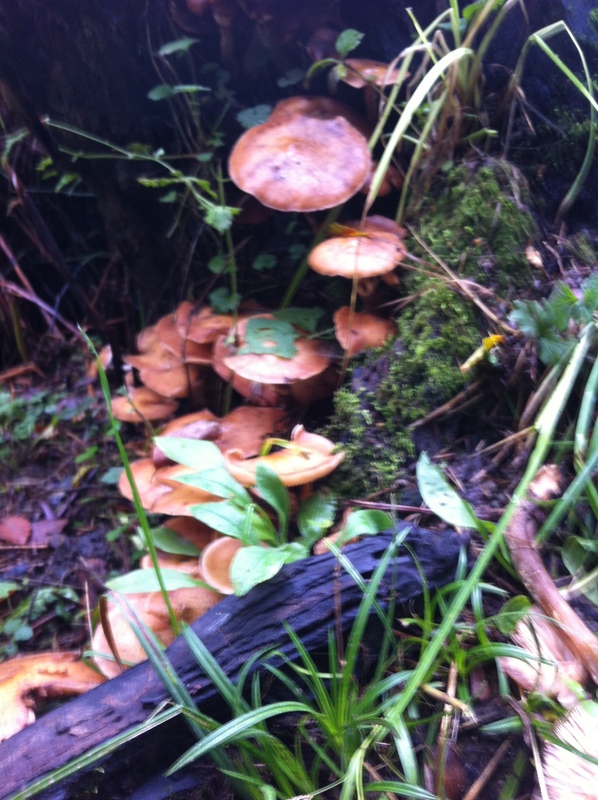 This entry was posted in Country Sense and tagged country, countryside, fungi, jerry, margot, mud, mushrooms, Poppy, Primrose, walk, walking, wellies, woodland, woods on October 23, 2012 by admin.